The figure of Washington Duke is represented wearing a suit and seated in an armchair. The sculpture sits on top of a three-tiered pedestal on an eight foot by ten foot square base, and all four sides of the pedestal are inscribed. The statue depicts Duke in a relaxed posture, representing an attitude of repose and meditation. The figure of a lion rests at the end of the right arm of the chair next to Duke's hand. South face: WASHINGTON DUKE / 1820-1905 / ANIMATED BY LOFTY PRINCIPLES HE EVER CHERISHED THE / WELFARE OF HIS COUNTRY WITH THE ARDOR OF A TRUE / PATRIOT; DILIGENT IN BUSINESS HE ACQUIRED RICHES, BUT / IN THE ENJOYMENT OF THEM DID NOT FORGET TO SHARE / WITH THE LESS FORTUNATE; A PATRON OF LEARNING HE / FOSTERED AN INSTITUTION WHICH PLACED WITHIN THE REACH / OF ASPIRING YOUTH THE IMMORTAL GIFT OF KNOWLEDGE; AND / WHEN THE ACTIVITIES OF HIS EARLY LIFE AND THE STERNER / STRUGGLES OF HIS MATURER YEARS HAD PASSED HE ENTERED / UPON A SERENE OLD AGE CHEERED BY A LOWLY PIETY AND / SUSTAINED BY AN UNFAILING TRUST IN GOD, WHO IN ALL THE / VICISSITUDES OF LIFE HAD KEPT HIM SINGLE IN HIS AIMS, / SINCERE IN HIS FRIENDSHIPS AND TRUE TO HIMSELF. North face: "FRIEND TO TRUTH! OF SOUL SINCERE, / IN ACTION FAITHFUL, AND IN HONOR CLEAR." 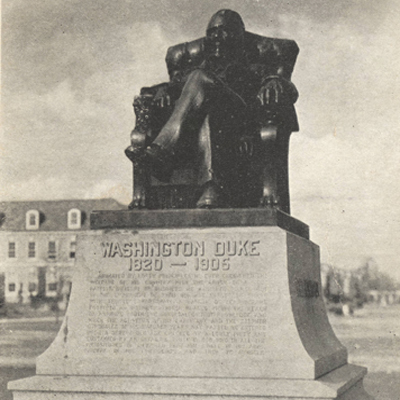 On Wednesday June 10, 1908, after the commencement ceremony of Trinity College (the predecessor institution of Duke University), a gathering occurred for the unveiling of the Washington Duke Memorial Statue. The crowd included Trinity trustees, faculty, alumni, and students, as well as friends and family of Duke. The crowd formed a procession and marched to the site of the statue at the Anne Roney gardens. Dr. Edwin Mims read a poem by Mr. H. E. Spence to express the sentiment of the student body, while Mr. James H. Southgate made a speech on behalf of donors. He spoke of preserving Duke’s spirit as well as commemorating the heritage of the college and gave a brief biography of Duke’s life and career. Dr. John C. Kilgo, President of Trinity College at the time, made an acceptance speech on behalf of the school, thanking the committee and friends; he spoke of Duke’s hard but quiet work for the college. Finally, Duke’s great-granddaughter, Mary Washington Stagg, unveiled the statue. After the unveiling, the crowd gathered to view the statue, and many citizens reportedly felt that the monument appropriately honored Duke’s energy. Washington Duke was born on December 20, 1820, into a modest family with an agrarian background. Though he opposed secession, he served in both the Confederate Army and Navy. After the war, he acquired his fortune in the tobacco manufacturing industry and came to be regarded as a benevolent philanthropist. His first donation to Trinity College, then in the town of Trinity in Randolph county, was given on the condition that the college relocate to Durham. Following the relocation, Duke made several more donations to the endowment fund, the first on the condition that women were to be admitted to the college. By 1904, Duke had donated approximately $480,000 to Trinity College. Though he made significant donations to other educational institutions, Washington Duke is best remembered for his generous donations to the University which now bears his name. Upon his death in 1905, friends of Duke started the successful movement to erect a memorial in his honor on Trinity’s campus. The statue sits facing south in the median just before the traffic circle on Duke University's East Campus, off Main Street. The traffic circle and the East Campus quad sit behind the statue. The statue sits in a grassy median, surrounded by a low manicured hedge. Mature trees and campus buildings are located on each side of the road.